This new sport has to be carefully considered from the beginning in regard to the safety of the participant, to third parties and with respect to all others outside the sport. Speed Flying is dangerious, it is an extreme sport which carries the high possibility of serious injury or even death if you are unprepared. This could be from improper use of equipment, equipment failure, not knowing the terrain you are flying, getting stuck on the side of a mountain and not being able to climb to safety or even misjudging current weather conditions. Designers, Manufactures & Distributors/Retailers can not and will not guarantee your safety when using any Speed Flying equipment. As you may be a pioneer in your area, make sure you maintain a responsible attitude in your first steps toward Speed Flying. Practicing on regular ski slopes is forbidden - it is recommended that you only go Speed Flying OFF-PISTE well away from any of the prepared ski runs. If there are no other Speed Flyers in the area, it is recommended that you contact the ski resort safety service. Take time to explain the sport and work towards creating a usable or restricted area for Speed Flying well away from the prepared pistes. A clear presentation with photos, video, safety explanation and demonstration is often very useful for any discussion with the ski resort management. An ideal area for the practise of Speed-Flying is to the side of the ski resort slopes in an off-piste area. Below image is a possible example for Les Arcs. 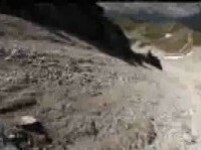 Note: The Les Arcs SpeedFlying Pro event in 2007 used this for their Downhill race course. 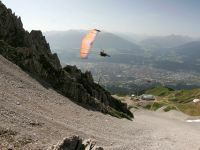 Beginners to the sport of Speed-Flying should learn in a safe and controlled environment under the care of a paragliding school set up and able to teach Speed Flying. The practice of Speed Flying requires the pilot to have a very good level of skiing ability. 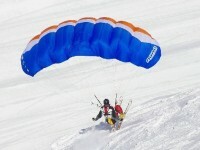 You can then adapt your paragliding or Skydiving/Swooping technical knowledge to this new type of flying. You will gain essential knowledge and will learn faster in a fun, controlled, less stressful and safer environment. You will then be ideally placed to discover the new sensations of Speed Flying. Speed Flyers must be responsible when they practice Speed Flying in any area. Do not swoop or overfly other skiers - dangerous flying endangers lives and may get Speed Flying banned at your location. Do not over fly prepared or marked pistes or any populated areas. Do not fly in areas marked as 'NO GO' Zones such as Avalanche risk areas etc. If you want to fly on marked pistes - contact the Ski Resorts Management Dept. and ask if they will grant you special permission to do so. You MUST know the area you are flying and know how to get to safety if things go wrong or you need to land and are unable to relaunch. Plan or work out your route/flight plan before each and every flight. It is absolutely essential to check current weather and snow conditions and the forecast for the day. Take any advice from resort safety experts, high mountain guides or other Speed Flyers who know the area. If there are other Speed Flyers in the area and they are not flying there is often a good reason - if you are not sure about the conditions or if they are suitable, ASK!!!. Check, check, check again... your equipment needs to be fit for purpose before each and every flight. NEVER ski or walk over someone else's wing, lines or equipment. Always tell someone where you are going and where you will be flying. for maximum enjoyment and fun. 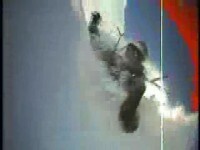 Speed Flying - involves skiing/flying down a mountain jumping over rocks and off ledges etc. ... to allow you to continue in a forward motion when desending a slope after landing from a jump or hop over rocks or an obsticle in your flight path, without skis - how do you foot launch (running with the wing overhead) in deep snow... or on a flat plato ??? You need to keep moving forwards so that the wing creates lift. 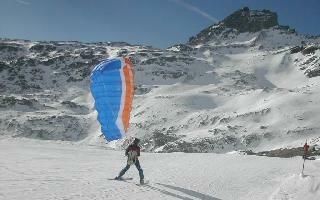 With skis you can also use your wing to kite/travel to a new launch site and continue your flight down the mountain. You need skis to reach Off-piste fly/launch zones. 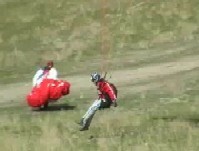 Speed riding with no snow or better known as Ground Launching or Speed-Gliding. It's the same as Speed Flying but without skis, so why Speed Gliding... ? As with Para-Gliding you launch off the top of a hill, glide and land at the bottom without touching the ground during your flight. Speed-riding in the summer has much more risk than winter flying due to the fact you are flying over bare rocks. The terrain has more effect on the wind and may make it much more turbulent resulting in your wing being harder to fly. Weather Issues - Thermals and air pockets may also be a problem. When summer flying and you hit an air pocket if flying too close to the ground you may drop and hit the ground before your wing can recover the lost lift. Do NOT fly in thermal conditions, if this is not possible - do not fly close to the ground. Allow a good safety margin - for this you need a wing with a much higher glide ratio than needed for winter flying. You don't have skis which makes touch and go landings impossible. If you touch down you have to land, then relaunch if you wish to continue your flight. With no skis it also make landing far more hazardous, a landing will most likely be on rough and rocky surface. Travelling at speed it is very easy to twist or even break your ankle on rough ground. Landings have to be done as you would when skydiving and land at walking speed. Harnesses for summer flying it's recommended that you have a harness with more back protection or air-bag impact protection (bump-air) incase of a bad landing. On snow you can slide or use your skis to aid your landings - on bare rocks its going to hurt if you try landing as you would on snow.